A BRIGHT SPOT: Above is Point A. 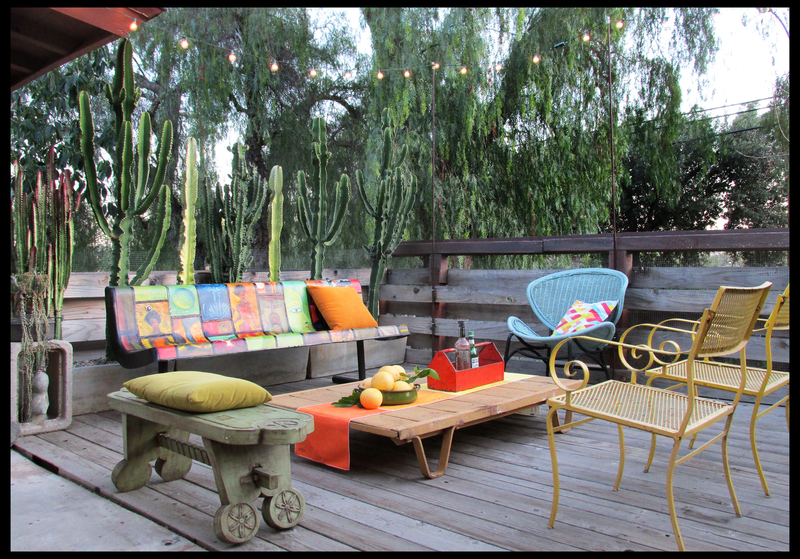 Also known as the deck off the kitchen, this seating area is the first stop when one enters the Rancho’s garden. Site of numerous costume changes, it’s been dressed as a dining room, a party zone, a chill-out area, even a succulent pop-up shop. I love greeting new visitors at the gate here, as they never fail to express surprise at the space … I love it even more as they move past it and realize it was just the beginning of the surprises in store. I was happy that the deck was dressed so colorfully for the editor and photographer’s visit(s) and they seemed delighted as well; here’s hoping the photos taken here capture it well. I was pleased that the photog wanted to return and take some night shots as well; I love when it’s lit for night use. It’s just so festive! The flip-side takes on a warm glow under the lights, rendering its collection of garden elements and curiousities more mysterious. Back in front, the deck is dressed in pieces old and new, including: My super-colorful decoupage bench, with new Mondrian-esque/Partridge Family bus/stained glass black outlines; a cool, blue mid-century wicker chair from an antique store in Orange; scruffy twin yellow-painted metal patio chairs (a gift from my brother-in-law. I love the curlicue arms! ); my green hand-carved wooden bench (an estate sale find); a wood and metal pallet table from an Arizona men’s prison. I love having this much color on the deck as it really sets off its weathered gray wood. I now know that the newspaper publication featuring the Rancho will appear at the end of April. But, there’s more: The glossy monthly, INLAND EMPIRE, also sent out a photographer to shoot the garden for use in their magazine! Suddenly, we’re hot … I’ll keep you posted once I know it’s scheduled to appear. I love your decoupage bench. I never thought of it, but ‘decoupage’ must literally mean ‘cutting from’, right? The pictures do a nice job of catching the lights right as dusk falls. Sweet! Many disparate items which together make a beautiful whole. Where shall I begin?………..a happy yet peaceful place, I love the formal arrangement and the color….and oh the collection table, I can’t help but feel a smile creeping into my cheeks while I gaze at it with my magnifing glass of course. You make me want to run right out and start rearranging my back yard……thirsting for more my friend. Thinking ALL of your gardens would make such a FAB book…….you know, the many lives of the deck…and the walkway and so on…. Fantastic series, Reuben. Just read all four installments and loved the projects. Cant wait to see all the other treasures make appearances in the Rancho garden! This looks so happy and inviting! I’m sure your guests are always excited to see the new and creative way you reinvent this space. I know, oh so well, about craving change, but seeing the different–AMAZING–ways you have recreated this space still blows my mind. 🙂 I can’t wait to see the published piece. Beautiful Reuben! When does the publish piece come out? 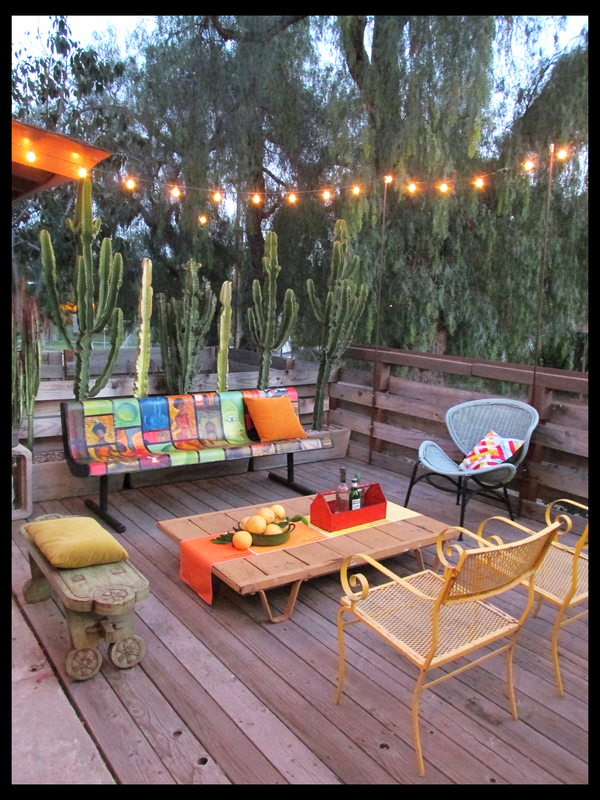 This series of posts has me thinking 2 things – my own 12′ sq patio, and how to do it for me or for special occasions. And to add staging for events to my services, if I get really crazy. 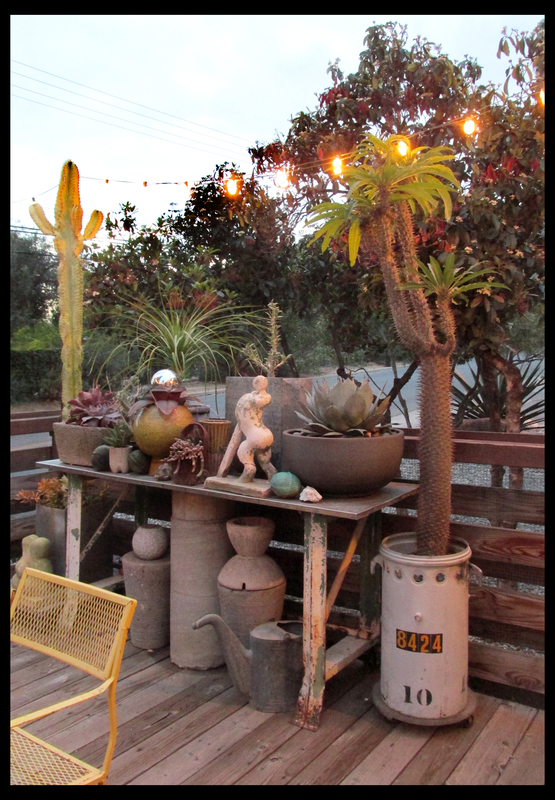 Enjoying seeing this post especially – the cacti potted, the large hang-out space – inspiring! I sure do like how your pics show so many sides of your home. And of you and Paul. And you’ve got me thinking of how I’m going to put this place back together now that the termiteing tents are off. It was crazy getting everything moved as to not lose them. If you’ve got any ideas I’m more than open to them!! Love the bench and also the cactus “screen” behind the bench. Brilliant! Thanks, JR … I never expected that screen to grow as quickly as it has; I love it too! Thanks for the good thoughts. We know we’ll always get through whatever it is. It is always easier when dealing with folks who are able to use whatever tiny bit of brain they might have!! Thanks for the offer of moments of Zen and wine. Best offer I’ ve had in days! Lighting a garden brings it to life. Your cactus backdrop is tres cool, and so is that bench.